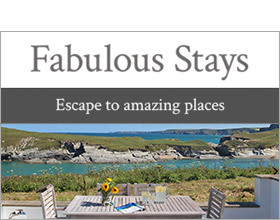 Whether it's sandy beaches, cafe culture or Cornish gardens you crave they are all within easy reach of The Mill. Just four miles from coastal hotspot Porthleven, this beautiful grade II listed barn conversion is part of a pretty rural farmstead in glorious green surroundings. With a footpath literally from the doorstep, this is a walkers paradise so bring your boots and head out to explore nearby Godolphin or Tregonning Hills or the famous South West Coast Path for amazing cliff top walks. There is a pub just over a mile away where there is a friendly relaxed atmosphere and a food menu where all tastes and budgets are catered for. Bustling with life all year round, nearby Porthleven is still a working fishing village where boats land their daily catch in the harbour which is surrounded by galleries, cafes and some excellent restaurants. The village is fast becoming a foodie mecca so pick up artisan breads, local cheeses or fresh catch of the day for indulgent self-catering. Porthleven is also home to a sandy beach but we suggest you head for the mile long Praa Sands just ten minutes away; a firm favourite with all age groups, the beach is home to a surf school and beach shop providing wet suit and surf board hire. The Mill has reverse level accommodation to take advantage of the lovely countryside views. A superb open plan living room and kitchen span the first floor with an incredible vaulted ceiling and wood burner creating a lovely homely feel. The ground floor bedrooms offer flexibility with one with king size bed with en-suite shower room, one twin and one with a zip and link bed offering option of a 6' superking bed or a twin. High quality furnishings, crisp linens and fluffy towels complete the picture. Outside is a small garden with a patio and barbecue; sit here and soak up the tranquil atmosphere and watch the cows grazing happily in the paddocks beyond. Three bedrooms: 1 x king size double with en-suite shower, basin and WC, 1 x super king double (zip/link to twin on request), 1 x twin. Bathroom with bath, shower over, basin and WC. Open plan living room with kitchen, sitting area and dining area and wood burner. Cloakroom with WC. Pub 1.3 miles Beach 4 miles.